This passing drill focuses on combination play in a small area. You can concentrate on the pace of the pass, angle of the pass, the weight of the pass, timing of the runs before and after the pass, one-two’s, and movement. Create a triangle about 10 yards a side. Place a player on each cone about 2 yards outside the triangle. You will only need 1 ball per triangle. Create multiple triangles according to the number of players you have. You can also place additional players at the starting position and have them rotate through each cone and return to the back of the line. Just be sure not to have too many players in line where they are waiting too long to play. Player 1 passes to player 2 on the outside of the cone. 2 returns the player to 1. 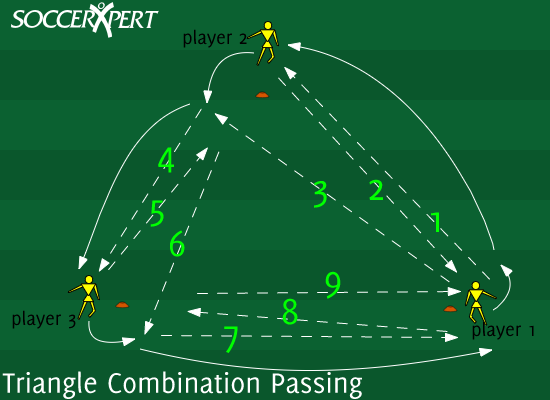 Player 2 opens up and receives the pass from 1 on the opposite side of the cone. Player 2 now plays to 3 on the outside of the cone and the play continues around the 3 cones. Switch the direction of the play to focus on different angles of passing.